This extremely quick gluten-free Thai fish curry recipe features a rich and spicy coconut broth with fresh herbs and vegetables. This gorgeously fragrant dinner is ready in 15 minutes! 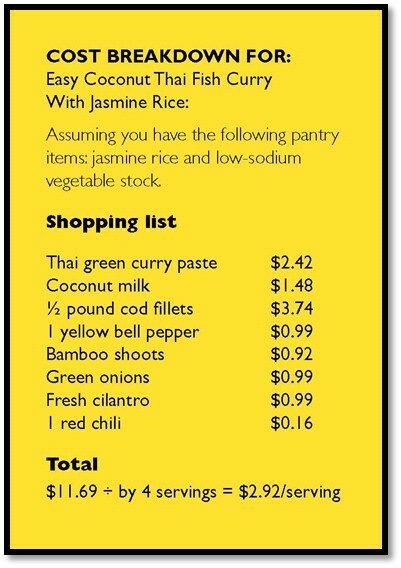 Prepare the needed amount of jasmine rice as directed on package. In a medium-sized pot (3.5 quarts or larger), whisk together the curry paste, coconut milk and vegetable stock till all the paste and liquid are smooth and well incorporated. On medium-high heat, bring this to a gentle boil and bubble for 3 to 4 minutes before adding the fish cubes. Turn the heat down to low, cover and cook for 6 to 8 minutes or until the fish cubes are cooked through. Add the sliced bell peppers, bamboo shoots and a bit of salt and pepper to the pot. Stir well and simmer on low heat uncovered for 3 to 4 minutes. Add the fresh green onions, cilantro and chili slices, if using, to the pot, stir well and cook for 1 minute. Turn off the heat and serve immediately in deep bowls with the steamed jasmine rice. Enjoy.